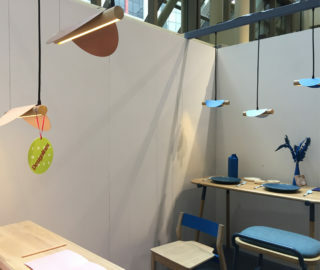 All throughout the Interior Design Show Toronto, our editors are on the hunt for spectacular products and installations. 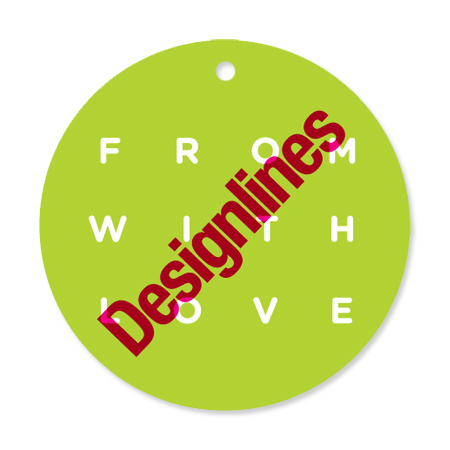 From January 19 to 22, we’re awarding our Designlines Loves tags to the most beautiful, most innovative, and downright coolest stuff we encounter. 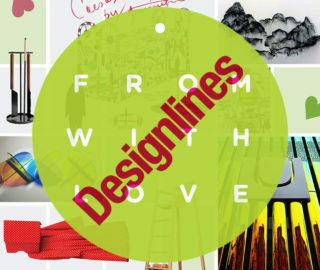 Below is the second batch of IDS designs that caught our eye. Keep track of everything we tagged in our master list. 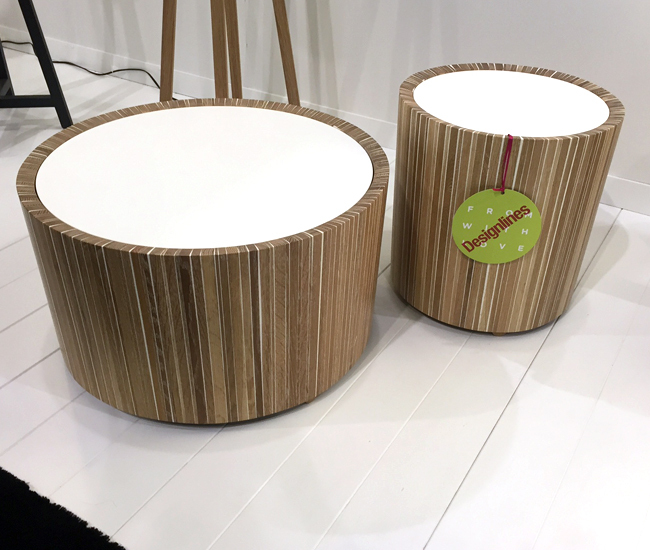 • Christopher Solar Design’s Drum Tables pop thanks to their simple form and natural varicoloured wood. With a white oak and white resin body white acrylic solid surface, they’re both cute and versatile. 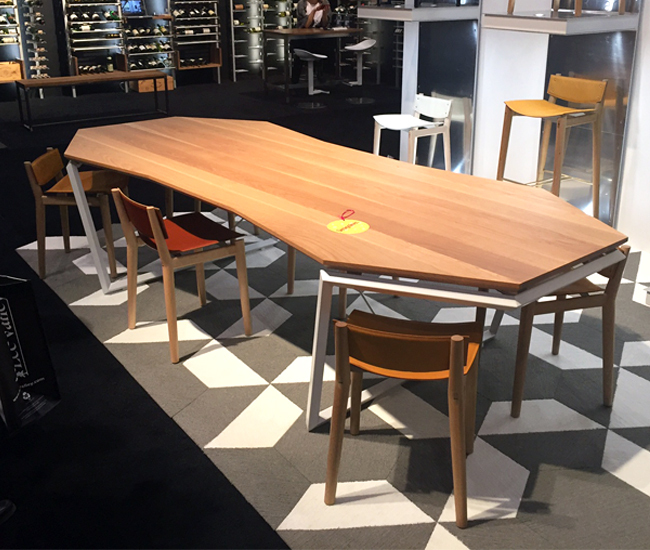 • It’s hard to find a big dining room table that departs all that much from the norm, but this m3 table from Miles & May is really striking. The beautiful natural white oak surface is supported by a white urethane base that runs parallel to it, while the twelve-sided shape means opportunities for socializing at all angles. Very flexible and very cool. 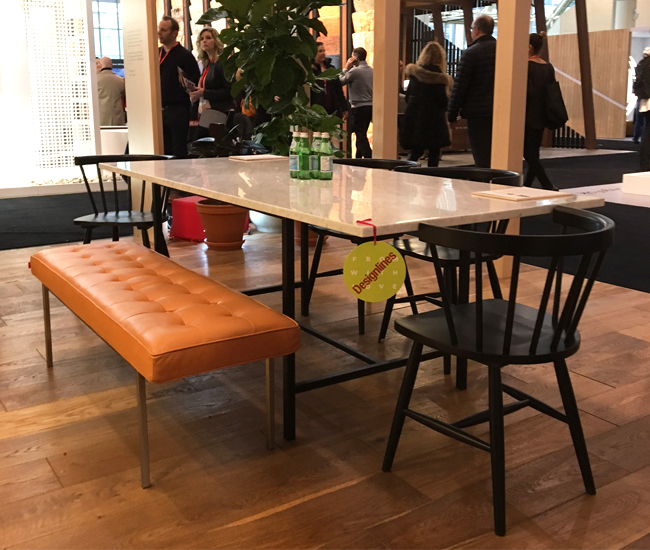 • The larger-than-life Stay Armchair by Slovenian product designer Nika Zupanc for her and Sé’s third collaborative collection caught the attention of nearly every passerby. 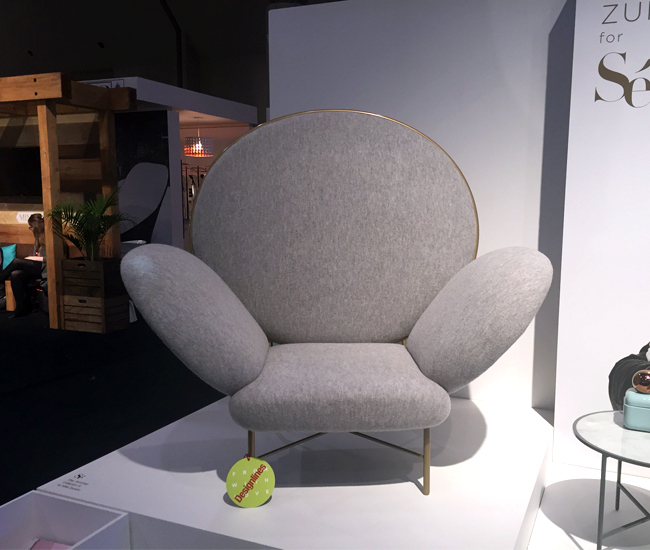 From a collection loosely based around a fantastical, bygone Olympic sports club, this chubby yet elegant chair is where a mid-century gold medalist might might indulge, ever-so-classily, in a highball. • Thanks for the hit of balmy weather, ARD Outdoor. 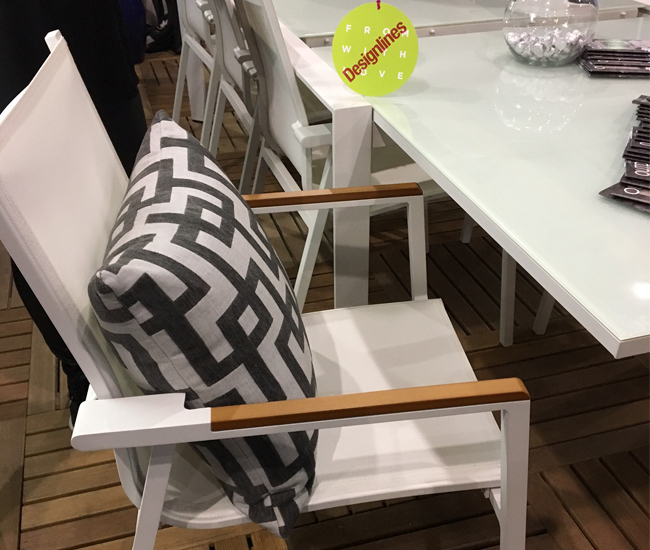 We were super impressed with the Madrid extension dining table in powder-coated aluminum and tempered glass top and the stackable Cosmo dining chair with sling seat and back and wood detailing on the armrests. • Casual and elegant, EQ3 pairs its modern Kendall marble dining table with Windsor-shaped Lyla chairs and the tufted leather Reverie bench (in Coachella cognac). 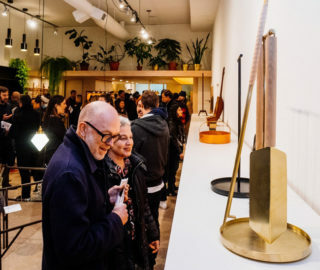 • Toronto’s Kroft debuted a new series of dining and side tables called Stir. 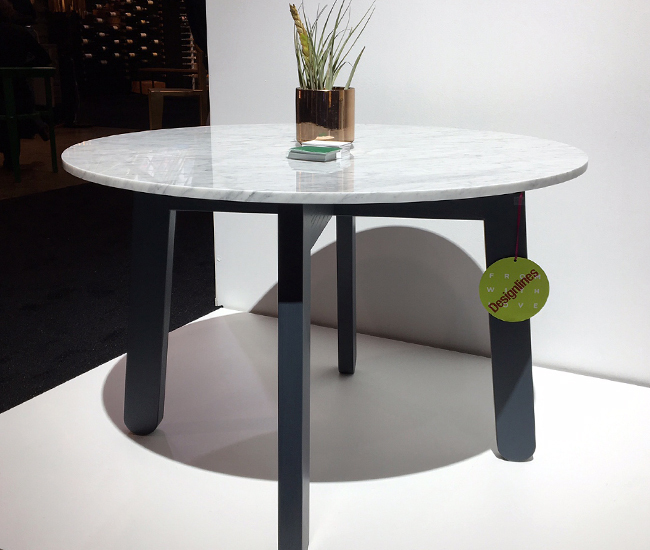 Made of ash and finished with water-based stains, we love the pairing of a marble top with popsicle stick–shaped legs. 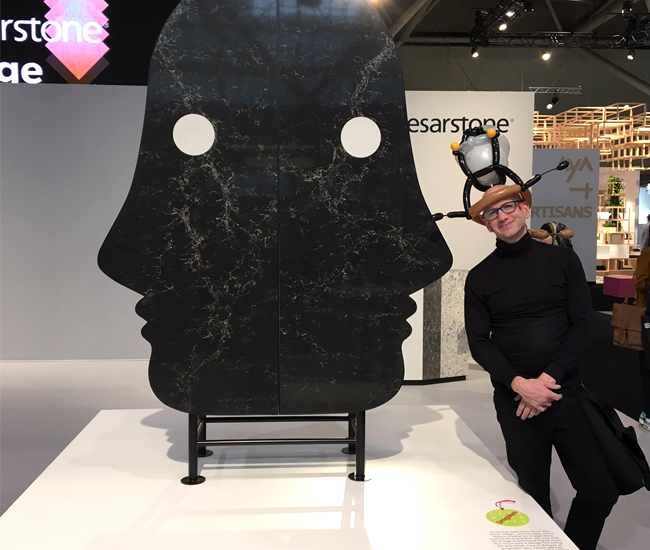 • Collaborative pieces by key note speaker Jaime Hayon and Caesarstone took up a good deal of real estate at the show. 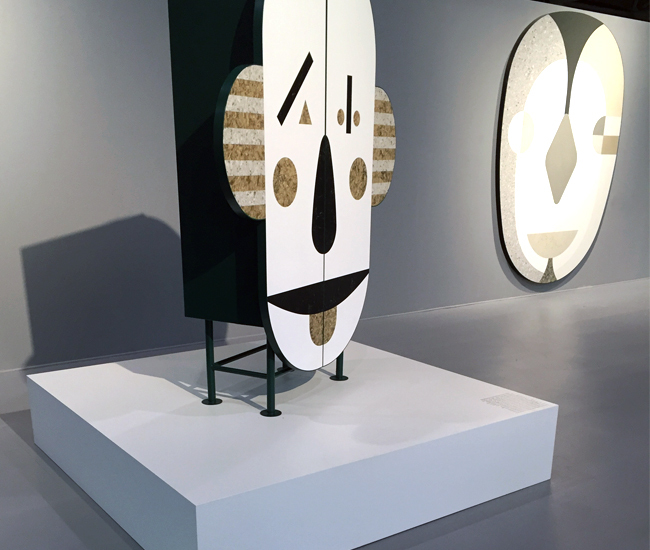 On display were carnival-themed furnishings, like this Two Faced cabinet, clad with the surfacing material. 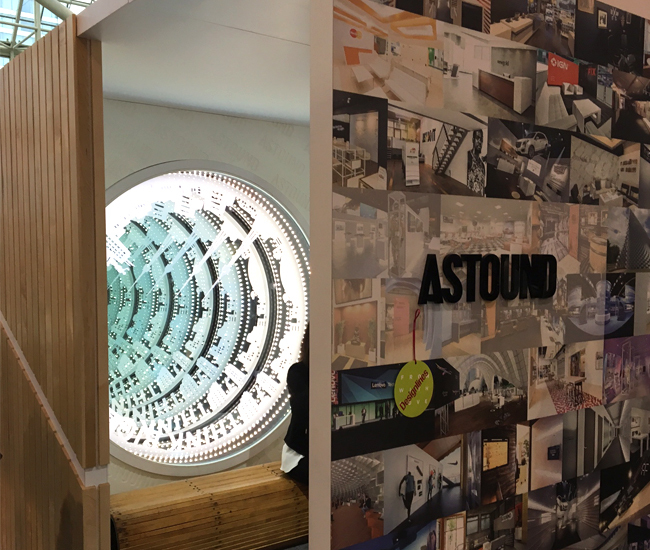 • Designed and built by Toronto custom fabricator Astound Group with Alison Milne Design, the Big Eye selfie booth, with its endless revolving light wheel, was a huge hit at the show. 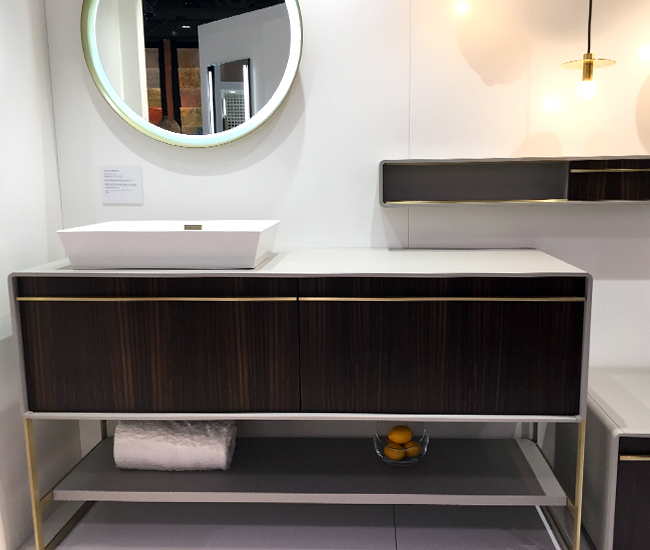 • WetStyle’s Déco bathroom is a glam, 1920s-inspired system pairing natural woods with metallic accents. A great way to carry the current gold trend into the bathroom. • Grohe’s Smart Control bath panel features easy-to-grip temperature and water pressure adjustment knobs that mimic the look of high-end stereo equipment dials. 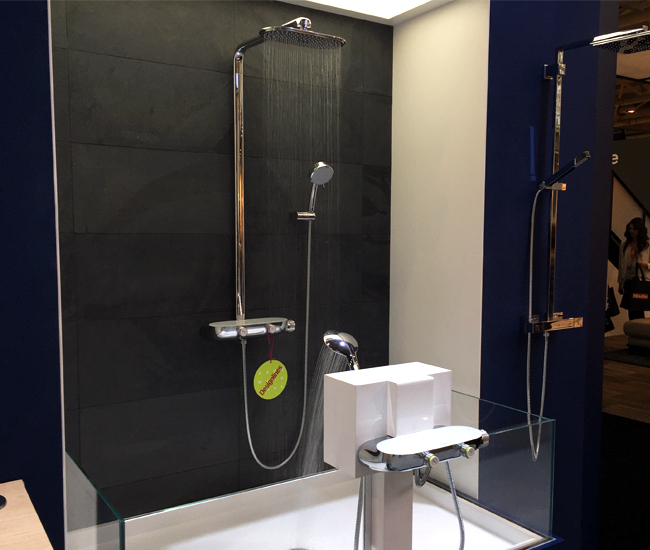 The control panel integrates a shelf to keep shampoo and soap at arm’s reach. • Tired of scrubbing? 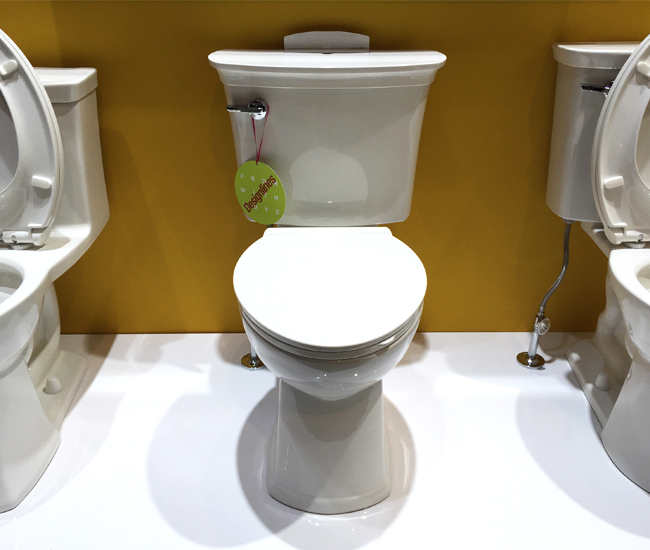 Load American Standard’s ActiClean toilet with one of its special cleaning cartridges to refresh your bowl at the touch of a button. Controls on top allow you to alternate between quick and deep cleaning cycles, and each cartridge lasts about nine weeks. 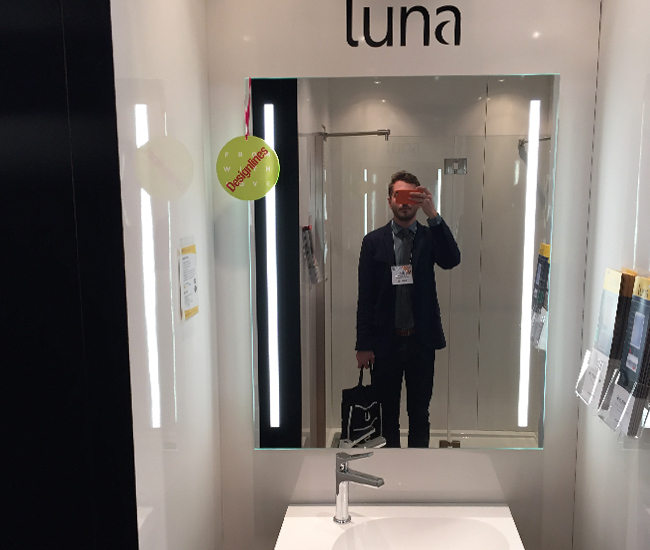 • LED light columns on either side of Fleurco’s Luna Sunrize put a modern, architectural spin on the salon vanity mirror. 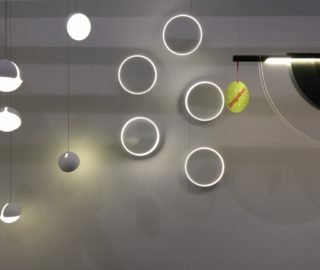 Another model, Halo, is completely bordered in LED lights. 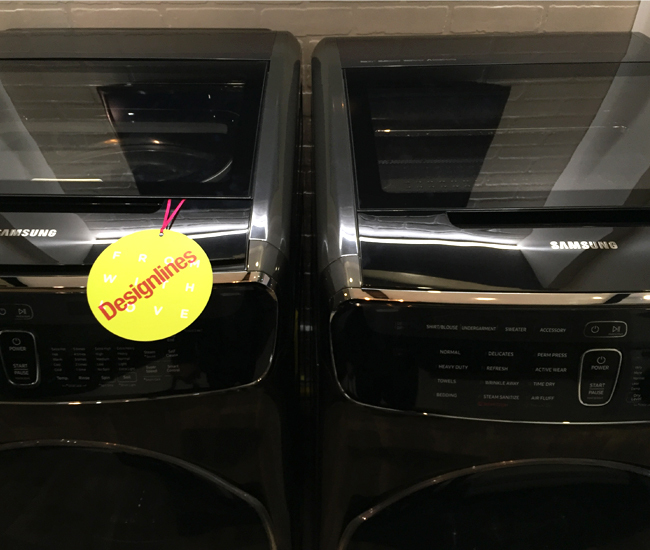 Both include a genius defogging feature. • Samsung’s Flexwash dryer includes a top compartment that uses steam to dry delicate items like running shoes. Even better, both the dryer and its complementary washing machine can be remote-controlled via an app – letting you wait until off-peak hours to start each load of laundry so you save cash on your hydro bill. 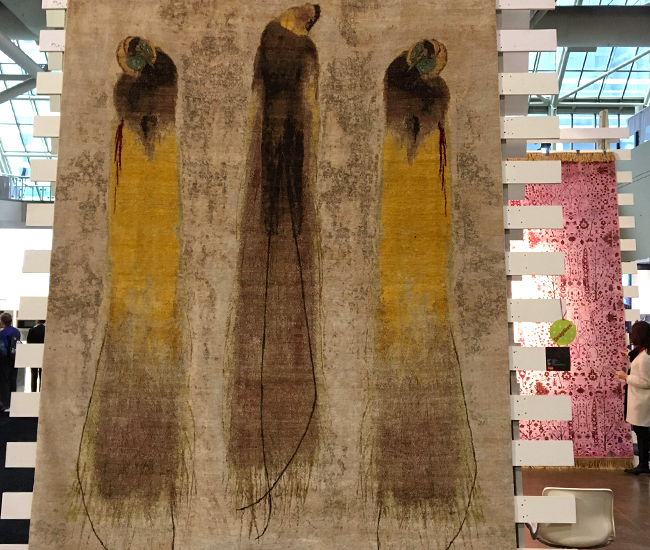 • The stunning Three Birds area rug, part of Rug Star’s Delft Supreme collection, is made of 100 per cent silk and hand-knotted in Rajasthan. 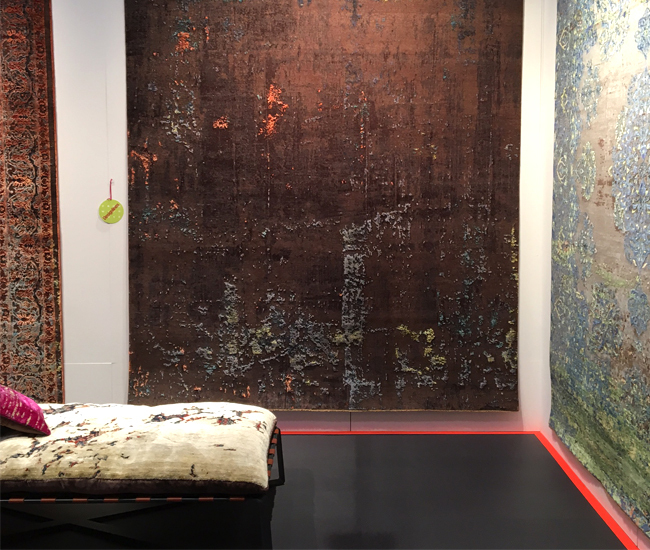 • The Artwork series of area rugs by Jan Kath are true to their name, appearing like canvases painted upon with knots of Tibetan highland wool, Chinese silk and nettle fibres. Also on show: Jan Kath’s first piece of furniture (in conjunction with with Dutch furniture company Founded), a day bed called Daydreamer. 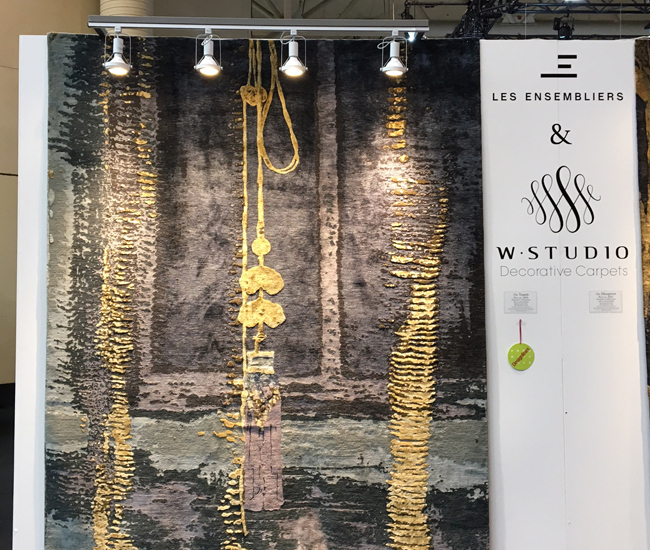 • Designed by Les Ensembliers, a Montreal design and build firm, the Tassels area rug – made of Chinese silk and Tibetan wool and hand-knotted in Nepal – is now available at W Studio. 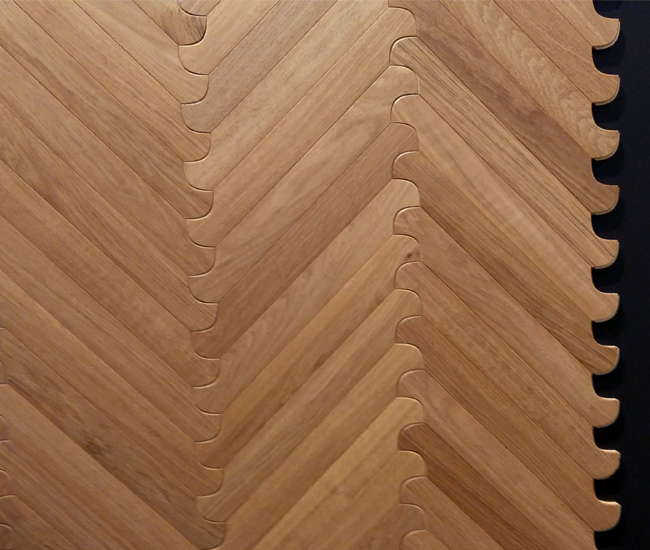 • Biscuit, by Patricia Urquiola for Listone Giordano, is a total rethink on parquet flooring patterns. The rounded edges are so incredibly unique. 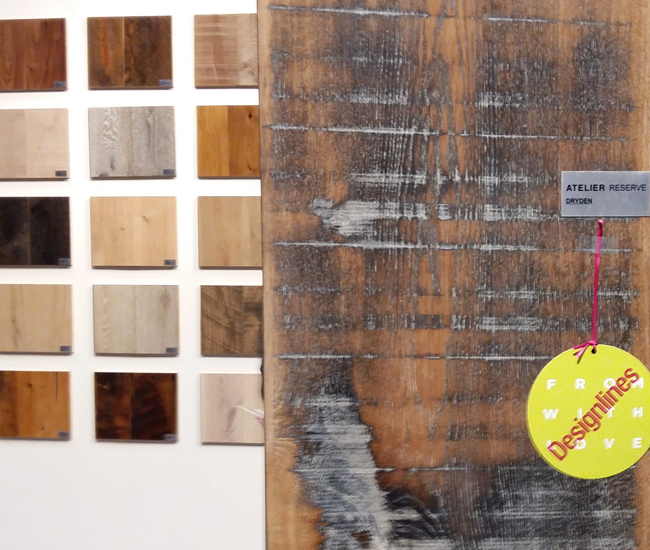 It’s very feminine – and who would have thought a wood floor could be? 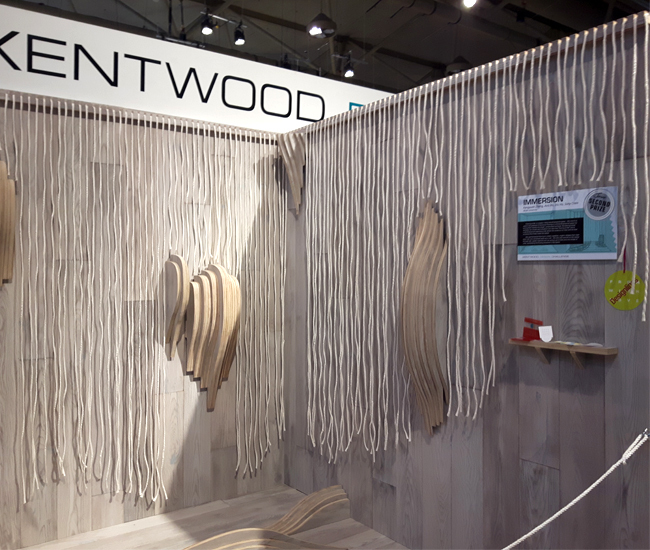 • The rough, rustic look and texture of Northern Wide Plank’s Atelier Reserve Dryden planks makes them perfect for adding warmth and character to a minimal space. 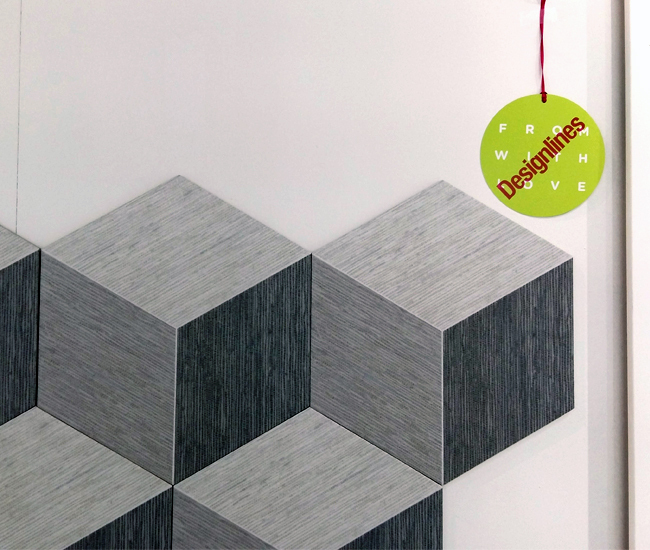 • We were also drawn to the Bali Hexagon Diamond Porcelain wall tiles from Vo Gres. 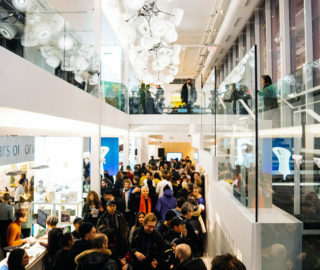 Their soft colours and subtle, textile-inspired texture, combined with the dramatic 3-D look provided by the graphics. 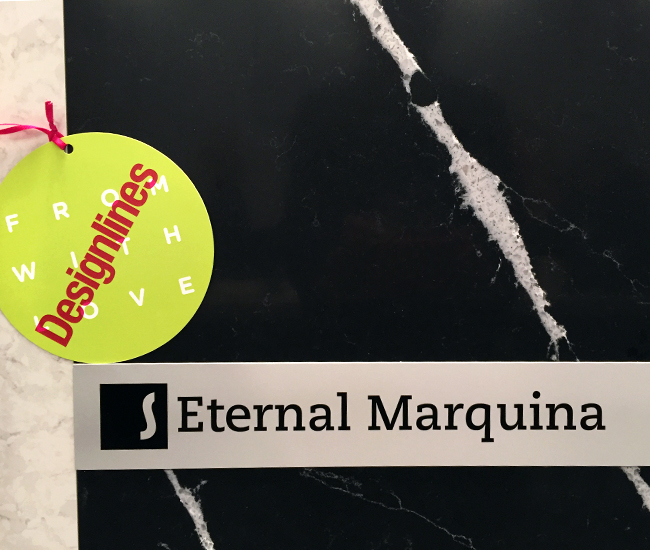 • Cosentino’s Marquina, part of the new Eternal collection of Silestone surfaces, is the most convincing quartz take on black marble we’ve yet encountered. Moody, masculine and totally irresistible. Available in matte suede or polished finishes. 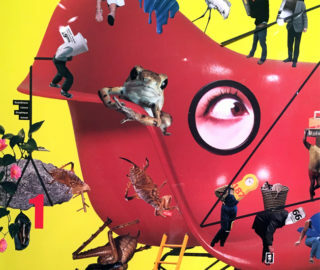 • Immersion by Fangyuan Zheng, Avis Ho, Iris Ho and Sony Chen won second prize in the Kentwood Design Challenge. 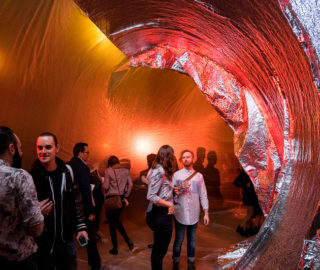 The team wanted to create a “multi-dimensional experience” out of a traditionally one-dimensional material. 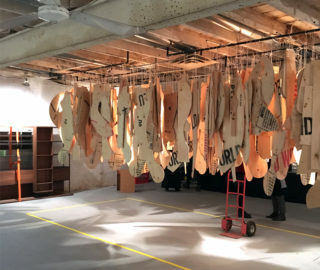 Floor boards were cut into organic shapes and then layered together as units that seemed to emerge organically from the flat floor and walls. 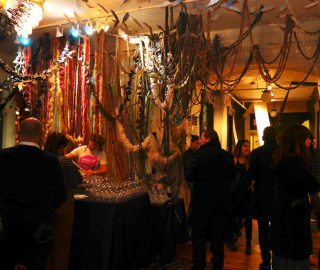 Adding further dimension, strands of soft yarn were hung at varying lengths. These worked to soften the space, with their loose forms bringing a fluid element. 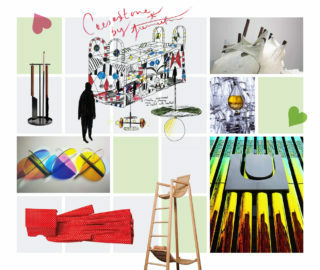 • Jazzing up the Designlines booth was the Prime Number wallpaper by Castor. 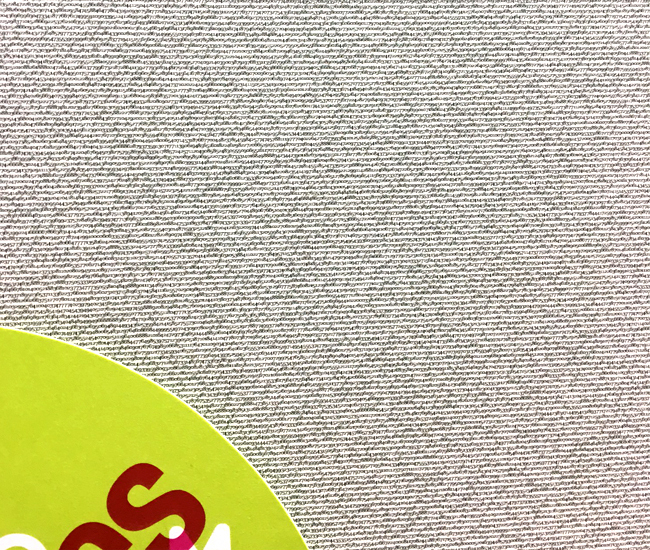 Produced by Rollout, the paper is decorated with the largest prime number known to date, running 22 million digits long.